Nowadays, in parallel with the increasing weight of the construction sector in the Turkish economy, a large portion of print and visual ads promote real estate developers’ concept housing, residence and mall projects. Hundreds of such projects, large or small, not only promise urban consumers a new home, office and lifestyle complete with various attractions, but also market urban spaces as ‘investment opportunities’ and ‘lucrative assets’. One important component of this economic growth model centered around construction is the urban transformation under the supervision of public agencies. Fadime: Temel, what are you doing over there? Temel: Building a house. I will sell it to Bulut Construction. Temel: I am into urban transformation; we are set to urbanize. Fadime: Come on Temel, I won’t quit my tea and hazel nut groves! Temel: I will buy you the best nuts and tea. Fadime: Tell me Temel, when will we urbanize? The commercial indeed correctly emphasizes that urban transformation dialectically changes the individual and the society; however, it also upholds in the most banal and coarse fashion the dominant paradigm on urban transformation, and particularly the construction drive following the Law on Disaster Prevention. It must be stated that the “urban transformation” debate is inflicted with a serious problem of definition. Referring to a reproduction of the space, the term “urban transformation” indeed covers a range of diverse concepts and practices such as “urban revival”, “sanitization”, “preservation”, “retrofitting” and “urban renewal”. Besides, it carries different professional meanings for various actors such as planners, architects and investors. Very roughly, we can refer to two historical practices on the extremes, for definition purposes. One is the “cleansing” and redevelopment of an urban space generally defined as a tumor. It involves wholesale demolition and redevelopment. Here, the most critical question is, whom this transformation benefits: the locals, other social classes, or investors? Another key question is, how the cost and funding is provided. In Turkey, the “demolish and redevelop” model is implemented across the board without any regard for the specifics of a given space. One case in point is the transformation of plots falling under the scope of the Law No. 5366 on Renewal of Urban Areas,3 shantytowns, and areas under high disaster risk, by the coalition of Housing Development Administration of Turkey (TOKİ), municipalities and developers. 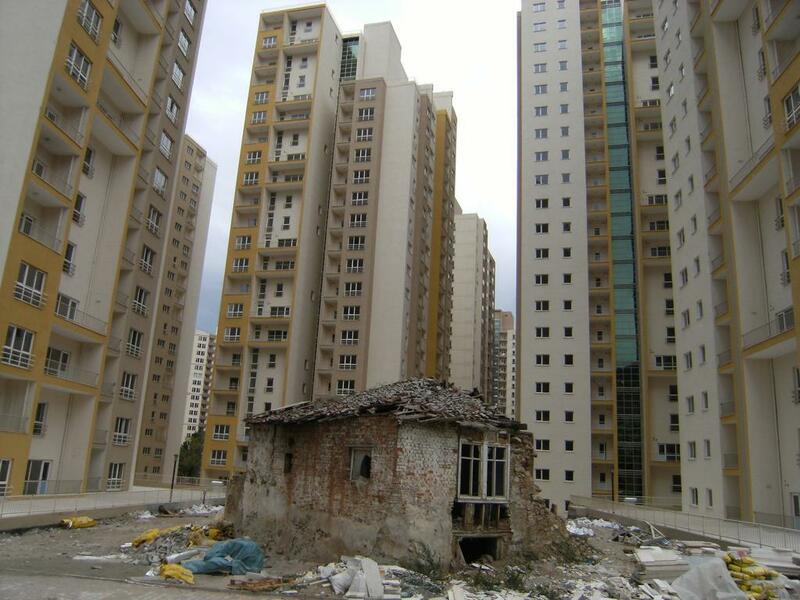 As far as working class neighborhoods are concerned, this practice can be summarized with the formula “forced evacuation – demolition – relocation of locals to TOKİ projects in the urban periphery.”4 It is a significant threat for a number of neighborhoods in the urban center and periphery, owing to rent-seeking. The second practice, which can be coined “the cautious transformation of living space”, consists of the improvement of the built environment and social life with the participation of locals and without recourse to “unnecessary” demolition. In fact, such a model has yet to be properly implemented in Turkey, because improving an urban area in line with the locals’ demands and needs, without depriving them of their location, neighbors, and community and thus granting legality to urban space is not as lucrative as the “demolish and redevelop” model of the construction sector, which prioritizes economic growth above all else. This immense appetite for urban transformation can be explained in part through the disparity between the use value and exchange value of urban space:7 In the neoliberal paradigm, the importance of a city or space does not arise from its use value as shelter and living space, a healthy environment, an infrastructure for production and commerce, an area of public interaction, etc. In today’s capitalism, the city increasingly becomes a commodity bought and sold; an instrument of profit maximization and speculation. Capitalism itself is based on capital accumulation, concentration and centralization, and neoliberal urbanization accordingly views urban land as a means of capital accumulation. This in turn leads to the privatization of public space, construction of malls on empty lots including post- disaster concentration areas, and the buying and selling of whole neighborhoods with high economic value (shantytowns and zoned areas alike, as if they were vacant plots) under urban transformation schemes. The urban planner Dr. Murat Cemal Yalçıntan summarizes the period from the early 2000s until the Law on Catastrophes in İstanbul as such: “Urban transformation and renewal practices mainly amount to an approach geared towards rent-seeking and real estate confiscation, indifferent to disaster prevention bar on paper, and negligent of poverty, and social and economic relations; accordingly they bring about nothing but the relocation of rent-seeking and poverty.”8 Discussions during the Law on Disaster Prevention and after, were inevitably based on the discursive and practical foundations of this first period of urban transformation with palpable results. 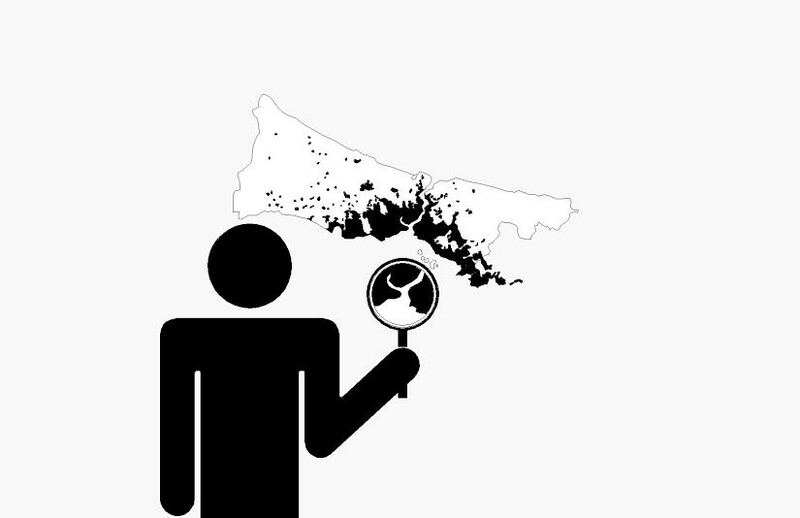 Law on Disaster Prevention: Is the glass half empty or half full? The Law No. 6306 on Disaster Prevention and Transformation of High Risk Areas which came into effect on May 31st, 2012 upon publication in the Official Gazette has the objective of “determining the principles and methods of improvement, liquidation and renewal geared towards the constitution of healthy and safe living spaces in line with scientific and esthetic norms and standards in areas under disaster risk and in any high risk development”. The law defines “high risk areas” which could engender loss of lives and property, and similarly “risky buildings” inside or outside the abovementioned areas, as “reserve development areas” where new residential buildings will be constructed. The law outlines the methods for the identification of such high risk areas and structures, evacuation and demolition processes, and development of projects after demolition. The law also lists the duties and responsibilities of public agencies. The signing into law of disaster legislation in an earthquake-prone country, the political leadership’s resolve, attempts to minimize risk via mobilization, and formulation of solutions to other urban matters while eradicating disaster risk can all be hailed as positive. No one would object to such an approach at least in principle. Why then is the Law on Disaster Prevention heavily criticized, despite a general consensus on the earthquake risk? Can such objections be explained by the “intransigence” of political groups? As mentioned above, many consider that the relation between urban transformation and the Law on Disaster Prevention is problem-prone in essence. In a nutshell, critics state that disaster risk is used as an “excuse” to legitimize and gear up urban transformation projects which create suffering (forced evacuation, gentrification, violation of property rights). The dissident position can be summarized as “the disaster risk does exist, yet current urban transformation practices are no panacea”. An analysis of the law indeed reveals that demolition is defined in extreme detail, priority is given to the “demolish and redevelop” method, and the emphasis on “improvement” (retrofitting) disappears after the first article. Immediately after the signing into law of Law on Disaster Prevention, numerous NGOs, trade chambers, community associations and civic initiatives issued a joint declaration which read “the urban transformation law itself is the looming disaster set to devastate our living space”.9 The declaration claims that the said law violates the “right to housing” stipulated in the Article 56 of the Constitution, and that “it is a far cry from the urgently needed legislation which will shield cities against disasters, with due consideration of issues such as local transformation, tenants’ condition, the temporary housing problem, funding, financial models based on social justice and equality, and the participation of all stakeholders”. A press release issued by the Chamber of Urban Planners (under TMMOB), too, lists the the law’s contradictions with basic human rights and the Constitution. The law penalizes any objection to an imposed agreement on disaster prevention. Risk-free buildings can be brought under the scope of law for the sake of “practical coherence”. The statement “Buildings in high risk areas are not to be provided power, water or natural gas, and all such services will be discontinued” is a clear violation of basic rights. Obliging local residents to cover all infrastructure costs (including the cost of identification and demolition of high risk buildings) will increase the debt burden of these already impoverished populations. The authorization of the Ministry of Environment and Urban Planning further enhances centralization. The few plots remaining in the public sector could be privatized. Real estate owned by public agencies outside of the Treasury (schools, hospitals and public housing) could be transferred to the Ministry, whether prone to disasters or not. Laws protecting natural and historical riches are made null and void, defined as “inapplicable legislation”. Development of grazing land is made easier. The temporary ban on all zoning and construction in reserve building areas constitutes a violation of property rights. The authority to impose “special” standards on planning resolutions could make the renewed areas unlivable. Aside from these arguments, it is suggested in some circles that high risk areas will be identified arbitrarily. Also, the Law on Disaster Prevention does not take into account any disaster other than earthquakes. The condition of tenants is not given due consideration, and no mechanism is designed their protection, except for a one-off rent allowance. Besides, there are no price-control measures to prevent impoverished residents from running into repayment problems or being obliged to sell their property for immediate gain, and thus be uprooted from their communities. The participation of local stakeholders was envisaged neither during the drafting of the law nor in the aftermath – aside from bearing its costs. Finally, the law in question centered on demolition does not approach transformation comprehensively, in the light of healthy urban development, ecological sustainability and social justice – the indisputable principles of urban planning. Criticisms get only stronger once you add the fact that previous transformation projects were far from exemplary in many aspects not least design, and that market players focus on profit maximization and give a back seat to public interest. What kind of a disaster law? It is not possible to answer the question “is the glass half full or half empty?” through an analysis of this law alone. It is factors like the run-up to the law, its general framework, and social struggles which fill or empty the glass. Even as opportunists have started to hawk urban transformation following the law’s approval, the administration must make its utmost to avoid the repetition of the widespread injustices / inequalities created by the first wave of urban transformation, and the characterless designs associated with TOKİ and luxury housing estates. First of all, the state must reach an agreement with citizens and NGOs as regards the principles of urban transformation. Such a consensus must avoid a speculative urban growth strategy which would trigger urban rent-seeking and consequently aggravate urban problems, and instead focus on public interest. It must counter the looming earthquake risk agreed upon by all, without actually inflicting a disaster on people’s lives. It must stick to the principle of not evicting anybody unless it is absolutely necessary. Poor and low-income citizens must not be forced to bear the economic brunt of the urban transformation process. Citizens must be able to participate collectively and directly in transformation decisions concerning their homes and communities. The legislation and content of the Law on Disaster Prevention, and the possibilities and risks it harbors are closely related to Turkey’s democratic maturity level. Naturally, the struggle to protect cities against disasters will from now on be an integral part of the struggle for democracy, and the actors of this struggle will have to fill up the glass. – This article was first published at the Perspectives Magazine. 7. Lefebvre, Henri, The Production of Space, 1991, Blackwell.